After he helped revitalize the American independent film scene with Stranger Than Paradise (1984), New York filmmaker, Jim Jarmusch followed it up with Down By Law (1986). While it didn’t make as big an impact as his previous film, Down By Law adheres to the director’s absurdist sensibilities and interest in the margins of life. It is something of a cinematic oddity — imagine The Defiant Ones (1958) directed by Samuel Beckett. Once again Criterion champions a marginalized film with an excellent Blu-Ray upgrade that not only features a stunning high-definition transfer but a comprehensive collection of supplemental material. Down By Law follows the adventures of three men. Zack (Waits) is a disc jockey who can’t hold down a job or keep his frustrated girlfriend (Barkin). So, he dejectedly wanders the deserted, garbage-strewn streets of New Orleans. Jack (Lurie) is a pimp who doesn’t seem to care about anything or anyone, including his girlfriend (Neal). Bob (Benigni) is an Italian tourist with a tenuous grasp of the English language (“Good evening, buzz off to everybody. Oh, thank you. Buzz off to you too.”). In Jarmusch’s world these three men are destined to meet. Zack and Jack are respectively framed and thrown in the same prison cell, only to be joined by Bob after he is arrested for killing a man with a billiards ball. The rest of the film documents their subsequent escape and misadventures surviving the swampy wilderness of Louisiana. What could have been a really boring film about three guys doing nothing is transformed into an entertaining comedy of errors by a talented cast. Tom Waits as the muttering D.J. and John Lurie as the cocky pimp are both excellent, but Roberto Benigni is the real star. Benigni is a gifted comic actor who knows how to use his oddball looks and voice to make any situation humorous. Viewers who only know him from Life is Beautiful (2000), should really check out his underrated performance in Down By Law. As the film progresses, a tentative friendship forms among the three men. When Zack and Jack come to blows, it is Bob who acts as the peacemaker by imparting his own unique sense of humor to the situation. He is the glue that holds them together. For example, when the three men are playing poker in prison someone mentions the word “scream.” Bob quickly looks through his little book of essential English phrases and ends up leading the prison in a hilariously rousing chant of “I scream, you scream, we all scream for ice cream.” It’s a funny scene that is only pulled off because of the actors’ ability to convince us that such an action is possible. 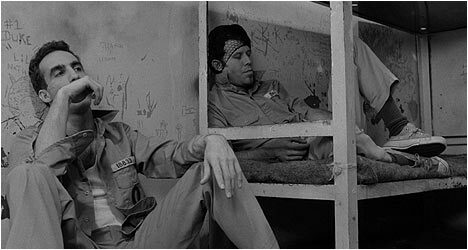 By filming several long takes of the three men doing nothing but talking and lying around, Jarmusch captures the banality of prison life and also allows the audience to really get to know these characters. Down By Law features the richly textured black and white cinematography of Robby Muller (who has also worked with Wim Wenders and Alex Cox). From the opening tracking shots of desolate areas and the run down slums of New Orleans, complete with the atmospheric Tom Waits song, “Jockey Full of Bourbon,” as accompaniment, Jarmusch draws us into his low budget world. Muller uses black and white to skillfully show the banality of prison in stark contrast to the lush, more primal side of the swampland wilderness. Down By Law is a very funny, wonderfully atmospheric film with three-dimensional characters that come alive due to the excellent cast and rich cinematography. The folks at Criterion continue to maintain their high standard of quality and pay tribute to a film that doesn’t fit into the typical Hollywood formula. Fans of Jarmusch and this film are in for a real treat with this Blu-Ray upgrade. The folks at Criterion have gone above and beyond the call of duty with a stunning transfer that highlights the contrast and Muller’s atmospherically textured cinematography. All of the impressive extras on the previous two-DVD set have been carried over to this new edition. In lieu of an audio commentary, Jarmusch’s “disembodied voice” provides his thoughts on a variety of topics pertaining to the movie in a separate section on the first disc entitled, “Jim’s Thoughts and Reflections.” Among the several topics covered, he talks about the use of music in Down By Law, filming in New Orleans and working with Tom Waits. The “John Lurie Interview” was done for French television during the 1986 Cannes Film Festival. The actual interview isn’t all that illuminating but the optional audio commentary Lurie does is hilarious. He makes fun of how he acted and talked in the interview and comments on how embarrassed he is of it now. There are also 24 minutes of outtakes which should be of interest to fans. Of note there is a cut scene with character actor extraordinaire, Pruitt Taylor Vince (Heavy). Another highlight is the very funny “Q&A With Jim.” In March 2002, Criterion had fans send in their questions to Jarmusch, 16 of which he answers. The director’s dry, wry sense of humor comes through as he talks about everything from the color of his hair to the all-night cast and crew parties while making the Down By Law to how his last name is pronounced. “Phone Calls” is a funny bit that has Jarmusch calling up Lurie, Waits and Benigni on the phone and asking them questions about their experiences on Down By Law. All three actors fondly recall their memories of the film and it is obvious that they are all still good friends with Jarmusch. Also included is an interview with the film’s cinematographer Robby Muller, a sometimes chaotic, sometimes tedious, sometimes amusing press conference for the movie at the 1986 Cannes Film Festival, a Tom Waits music video directed by Jarmusch, and a great collection of black and white and color stills from location shoots and behind the scenes.